Large print edition of the Hebrew Old Testament. 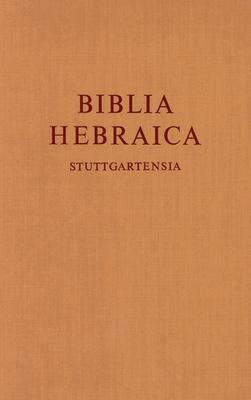 A revision of Kittle, Biblia Hebraica prepared by H. P. Ruger and other scholars on the basis of Manuscript B19A, in the National Public Library, St. Petersburg, Russia, with a thorough revision of the Masoretic apparatus by G. E. Weil. Introduction in German, English, French, Spanish, and Latin. English key to Latin words, abbreviations, and symbols. Description: Fabric covered boards. Black and red lettering on spine and front cover. Previous owner's name written on front free end-paper. There is no other writing in the book. Thick 1,574pp. Full refund if not satisfied.